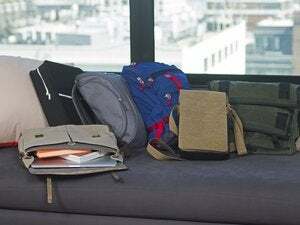 For the environmentally responsible mobile Mac user with panache, Monsoon Vermont makes a line of colorful laptop bags and totes made out of recycled plastic trash (which has been collected, the company says, by scavengers in Indonesia). 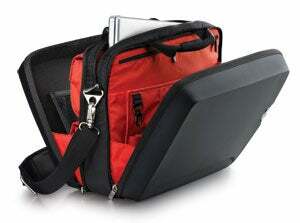 The Laptop Bag ($90) is trimmer and lighter than most, though with plenty of padding and pockets for your stuff. The Tough As Nails Tote ($45) isn’t specifically designed to carry a laptop, but it’s big enough to hold pretty much anything. If you don’t require a full-fledged bag but still want to be environmentally correct, check out TightJacket laptop sleeves ($25) in faux tiger fur and other unusual prints. Like any sleeves, these will protect your laptop from scratches and from inadvertently opening in your shoulder bag, but they don’t have any padding. The green angle? The company makes its sleeves out of unused bolts of spandex (most of which it buys from swimsuit manufacturers), which would otherwise end up in a landfill. One by-product of TightJacket’s unique sourcing strategy is that many of its sleeves are one of a kind. There are, of course, plenty of new bags in a more traditional mold. Logitech’s Kinetik 15.4 Backpack and Kinetik 15.4 Briefcase ($100 each) are great for anyone who travels rough. The laptop cases have hard outer shells and padded inner sleeves that cradle your MacBook, they sport plenty of internal pockets, and they come in both briefcase and backpack forms. For a truly professional appearance, you can spring for the sleek look of leather. MacCase’s Premium Leather Collection (bags, $200; sleeves, $90) includes sleeves, shoulder bags, and iPod cases in black, red, or beige. You can buy them individually or in coordinated combo sets. If you travel with your Mac, iPod, or any other electronic gizmo, you know that keeping the batteries charged can be tough. Fortunately, five new gadgets can help you keep your batteries full and ready to go. Tekkeon’s myCharger ($25) lets you take one charger for all your mobile gadgets. It has seven adapter tips that’ll let you charge iPhones, iPods, BlackBerries, and mobile phones from LG, Motorola, Samsung, and Sony Ericsson. Along the same line is Iogear’s Gear Juice - Mobile Pocket Power ($50), which comes with six interchangeable tips to fit a wide variety of mobile devices. If all you need is to keep your iPod running, you should look into Energizer’s Energi to Go Portable Power for iPod ($30). The pink-bunny people have created an external battery pack with two AA batteries that can theoretically provide 35 to 45 hours of music playback on your full-size iPod (it supports fourth- and fifth-generation models), and even more on the iPod nano. In the building-a-better-mousetrap category, there’s DLO’s Power Bug for iPod ($25). Of course, Apple sells its own wall charger for the iPod. But the Power Bug for iPod is cheaper and smaller than Apple’s $29 iPod charger, and it has a status light that glows green or red to indicate power status. DLO also sells the Power Bug for iPod shuffle ($23). Of course, if you want to carry your iPhone around au naturel (the phone, not you), that’s your business. But because of its price, you may be concerned about everyday scratches and dings, and you probably want some form of protection. Fortunately, there are plenty of options for keeping your iPhone safe and sound without adding too much bulk to the handset’s elegant profile. Zagg’s Full Body Shield for the iPhone ($25) is made with Invisible Shield film, a transparent, virtually indestructible adhesive film that will keep your iPhone scratch-free but won’t interfere with your operating the touch screen. NLU Products’ BodyGuardz for Apple iPhone ($25) is a pair of transparent films that will keep the front and back of your iPhone as pristine as on the day you took it out of the box. If you’re looking for something that will protect your phone and give it a distinctive look, you might consider GelaSkins for iPhone ($15). These adhesive films for the back of the iPhone come in dozens of colorful and eye-catching designs and include downloadable matching wallpaper for your phone. 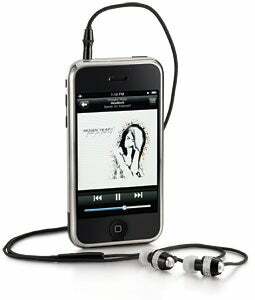 The earbuds that come with the iPhone are perfectly fine for some people, but many of us want alternatives. If you’re mainly looking for a way to improve your calling experience, take a look at Aliph’s Jawbone Headset ($120). This slick Bluetooth headset comes in black, silver, or red and sports military-grade noise-canceling technology to make your phone calls crystal clear. 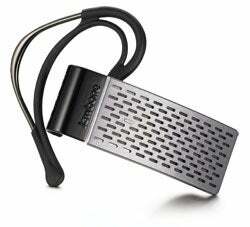 If you need something that handles music as well, check out V-moda’s Vibe Duo ($101). These wired canalbuds are fully compatible with the iPhone’s recessed audio jack and feature a built-in microphone to let you take phone calls, too—and, like Apple’s earbuds, they include a simple remote control on the headphone cable. If you’d rather simply use your existing headphones with the iPhone’s pesky recessed headphone jack, you can do that with the help of Belkin’s Headphone Adapter for iPhone ($11); be warned that the adapter is a bit on the bulky side. Shure’s Music Phone Adapter ($50) takes that idea a step further by not only letting you use your existing headphones but also adding a microphone and controls that allow you to both make and receive phone calls. If you or somebody you care about is heading off to the wilderness, you should know about Spot ($150 plus service fees). It’s a satellite-based emergency beacon that lets you send emergency requests to 911, or messages to family and friends to let them know you’re OK, from almost anywhere on the planet. It also lets family members (or whomever you want) track your whereabouts via Google Maps. 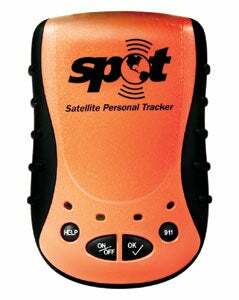 Spot is smaller than traditional emergency beacons, and it’s less expensive to boot.